Remember when your artistic endeavors were proudly displayed on the refrigerator? And remember when you got called in to the principal’s office because of your disturbing drawing of a zombie eating the brain of an alien? 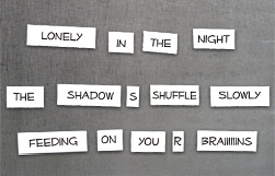 Now you can combine your, uh, talents with these macabre and monster poetry magnets by Magnets de los MUERTOS. Not only is Trick ‘r Treat finally being released on October 6th, but you can win a copy of the DVD from Dread Central. After 2 years of this movie being locked away in the studio vault, this is a highly anticipated Halloween movie. Some reviewers are even calling it the ultimate Halloween movie. What do you think? Make this Halloween season easier on the whole family. parent hacks has compiled their best family-friendly Halloween tips (aka “hacks”). There are a BUNCH of new Michael Jackson costumes this season. The high end ones are actually pretty cool. And if you ever thought of selling your MJ inspired vintage clothes, some rabid eBayers would like to have a word with you. Got any Halloween links to share? Leave your favorites in the comments section! Haunted Attractions range from amateur haunts in your neighbors front yard to huge haunted mazes created by the pros. Major cities usually have a handful of options, but smaller towns also have their share of events, too. 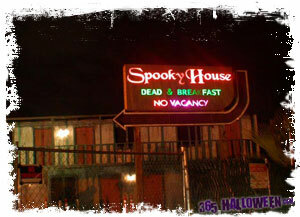 Check out HauntedHouse.com for one in your neighborhood. You haven’t carved your jack-o-lanterns yet? Get thee to a pumpkin patch! 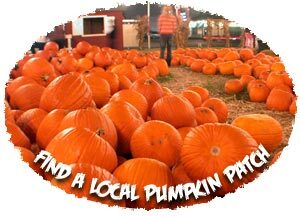 These kid friendly events – pumpkin patches, corn maze, hayrides, etc. 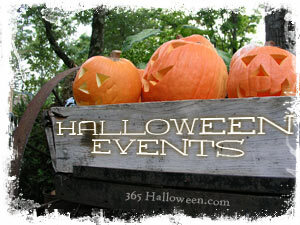 – make a great day trip for the family or a trick-or-treating alternative. You can spend some time outside in the crisp Autumn air and partake in fair-like activities such as face painting, bounce houses, and petting zoos. For a scare from the other side, visit a truly haunted house. RealHaunts.com has an extensive list of haunted places ranging from houses, businesses, schools, bridges, places in nature, and yes even cemeteries. 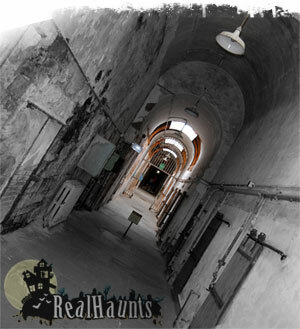 Users can submit suggestions for haunted places as well as leave comments and stories about their experiences. How will you be spending the next few days? I’ll bet your potion cupboard could use a little added mystery. Whose doesn’t? Download these magical and menacing potion labels from Love Manor and have your glue stick at the ready. 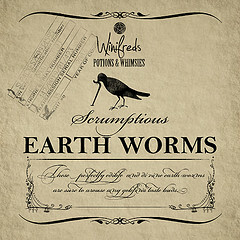 Transform your spice jars and empty booze bottles into such concoctions as Life Renewal Potion, Scrumptious Earth Worms, and our favorite, Snake Oil. They all have a gorgeously designed, decaying vintage look. For a next to free alternative, some Dollar Tree stores have a ghastly collection of potion labels, too. Have you made your own potion bottles? Drop a comment and let us know. We’re dying to see them. 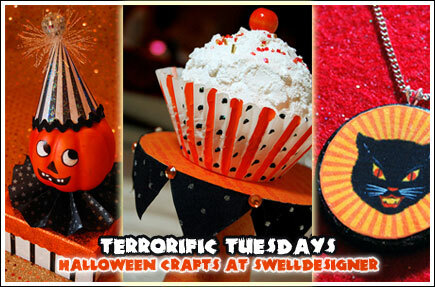 In addition to her own projects, she is now adding a Halloween Crafts and Ideas Roundup that will include other spooky projects from around the Internet. If you’re the DIY type, be sure to check back weekly for more creative inspiration. There’s always something new going on at Zombie Pumpkins. 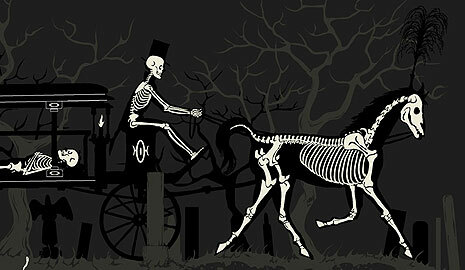 Proprietor, stencil illustrator, webmaster, and zombie-wrangler, Ryan, is a man of many talents and ideas. Not content to let his site rot like an old pumpkin, it receives a steady creative transfusion every Halloween season. So what’s new at the best pumpkin carving pattern site on the Internet? Each year a new zombie-related theme for the website is chosen and for 2008 it’s “Night of the Zombie Pumpkins“. As always, there’s an amazing new site design to go with it. It’s seriously worth it to visit the entire site just to see how detailed and cohesive the design is. Finally, the real guts of the site are the amazing new pumpkin stencils that come from Ryan’s original illustrations. The collection is already huge, but he adds new designs all the time. Freshest from the pumpkin patch are shown below. For those about to carve, we salute you! One aspect we really like is that all of their designs are free of text. 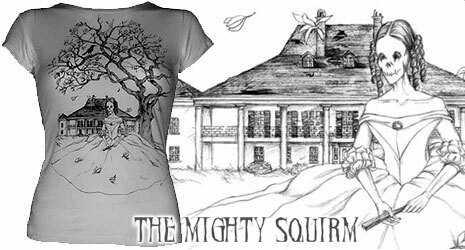 As The Mighty Squirm says, “each of our designs serve as the beginning of a romantic, thrilling story that really drives your imagination”. The illustrations are intriguing and detailed enough to speak for themselves.